At the end of last year, we moved our boy from a cot bed to a toddler bed - it was a big moment, it was the day the 'bars' came down - it was the night he realised he could climb out of his bed... and into mine! We had a Toy Story themed bed with curtains and bedding to match but that didn't really make his room his own I don't think. Also, due to the size of Max's room, we are limited for space and therefore found it awkward to sit next to him to read his bedtime stories so they continued in our room, then as he was nodding off we'd carry him over to his room. 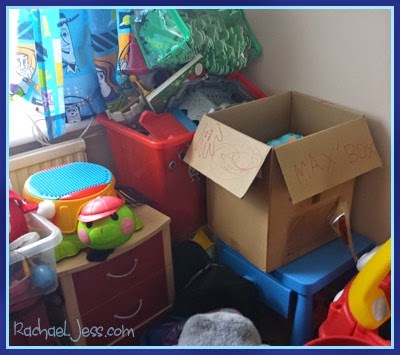 After about 6 months of this, I figured we needed to make some changes to get him in his room, to get him to want to go in his room and to basically make the room his, and not just a dumping ground for his toys. The 'toy room' soon to be a little boy's bedroom! We gave it a Spider-man theme and got Max involved with putting his bed together and his curtains up. 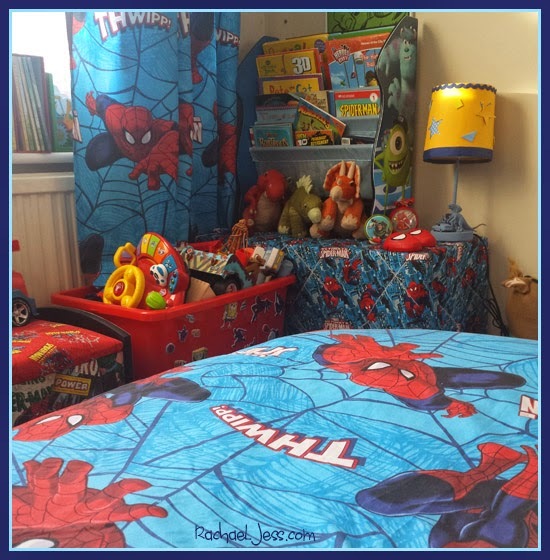 I decorated his toy boxes and furniture with a Marvel theme and put up Spider-man pictures and so it became 'my Spider-man room'. We bought him a single size bed - a big boy bed. The main reason for this was so we can sit on the bed with him whilst we read him his stories, we can lay next to him should he have a bad night and should he decide to get in my bed in the middle of the night - I have the option of crawling into his. We immediately had Max going into his room for his nighttime stories and falling asleep in his bed. Whilst I saw this as a big win, I found the mattress we had was extremely uncomfortable and I ended up fidgeting whenever I put him to bed. 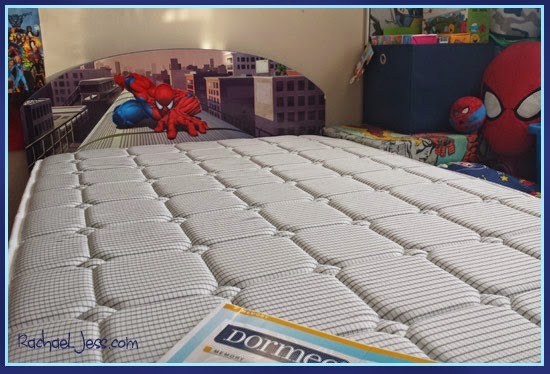 I suffer from scoliosis, which I don't let rule my life in any way, but I have no choice when it comes to sleeping, I really feel it the next day if I've spent too long on an inadequate mattress, so I was extremely pleased when we got the Dormeo Memory Mattress. This mattress is amazing and I find it rather an odd sensation that when we are lying down on it there are no feelings of the mattress. No springs digging in or foam dips, like I said a rather different sensation, but it's so comfortable - I understand that you 'sink' into the mattress to give you full body support and it does do this but there is no feeling of 'sinking' as such, just a feeling of well-balanced resting. I love it! I must admit that the first night we got the mattress I may have stayed the night in my boy's bed and I didn't have so much as a niggle of a backache in the morning! The Dormeo memory mattress has other great qualities as well as giving you a good night's sleep, even for those who change positions throughout the night and sufferers of back problems as its responsive surface maintain the spine in the perfect alignment. It also has air vents for optimum breath-ability for the mattress, anti-static protection against dust and anti-allergic anti-bacterial protection and the whole thing has a cotton cover with carbon fibres. And whilst the mattress gives an impressive 15-year warranty - it cannot guarantee 3-year-olds will sleep on it all night. 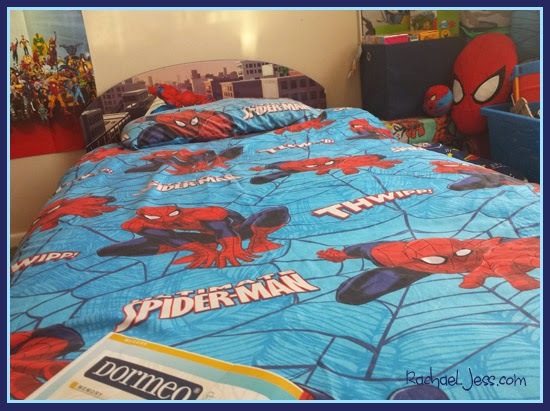 But I take my wins where I can, we have a marvellous bedroom, Spider-man bed with a comfortable mattress that my boy is more than happy to get into at night for his stories. We'll tackle the getting up in the night another day. Disclaimer: Written in collaboration with Dormeo. Thanks Keri, this is my first experience with memory foam mattress - will definitely being getting one for my bed now. that mattress sounds amazing. I'm always on the lookout for a good mattress for my back. Mine has served me well for the past 12 years or so but we are looking for a new one soon. Glad the transition to big bed is going well. Miss T's bars came down about a week or so ago and so far she hasn't figured out that she can get out of bed herself - phew!